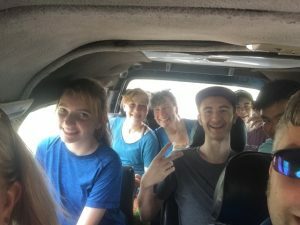 On Saturday morning, we had a low key start to the day: breakfast at 9, some time for re-packing, playing catch with the rugby ball, then hopping into the vans again for the trip to Dagbamete. 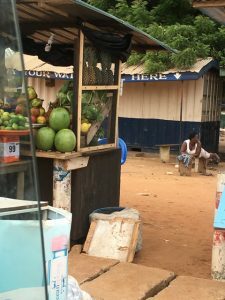 We stopped a couple of times along the way, to pick up some food at a roadside market, then again to walk across the Volta River and enjoy the fruit, avocadoes, bread, and spicy goat kebabs for lunch. The roadside views were varied, full of frenzied activity, and, at times, overwhelming. We will leave you with some photos for now and add more detail later in a future blog post. 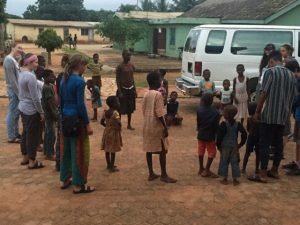 We were very warmly greeted upon our arrival in Dagbamete and are looking forward to settling in for village life.